Discovery Island is an ancient place. Long ago, a nomadic tribe found the Tree of Life and decided to live beneath this wonder. Now, the architecture and style of the land is whimsical and colorful. However, when they first began their lives on the island, they created stone statues celebrating some of the animals found in the roots and bark of the tree. This fella can found in the walkways of the seating area at the Flame Tree Barbecue which is wrapping up some refurbishment. The ponds and pagodas certainly create a peaceful atmosphere. 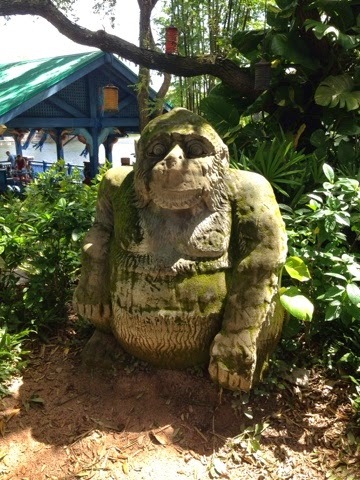 And this "ancient" statue of an ape hearkens back to the old days when the island was first discovered.